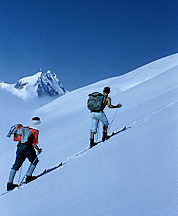 The 1950s through 1970s have been called the Dark Ages of backcountry skiing in the Northwest. Downhill skiing was booming, but only a few intrepid skiers ventured into the backcountry during that time. Joe and Joan Firey were among the leading lights of that era. 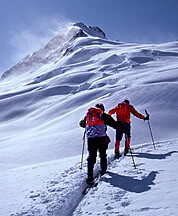 The Fireys started ski touring when they lived in California, but it wasn’t easy because the Sierras were so far away. When they moved to Seattle in the mid-1950s they got interested in ski touring with The Mountaineers, where most of the active backcountry skiers were to be found at that time. Joe signed up for a few Mountaineer ski outings and soon was leading trips himself. Joe and Joan’s friends John and Irene Meulemans became their most frequent and energetic ski partners. They repeated classic tours established before World War II around the Cascade passes and on the volcanoes and began pioneering classic tours of their own. In the late 1950s the Fireys and friends began skiing Eldorado Peak from the south, a route that became feasible after the North Fork Cascade River road was extended in 1948. Joe’s favorite spring trip was to Boston Basin, which offered better slopes than Eldorado and was easily approached from the mine-to-market road below the basin. 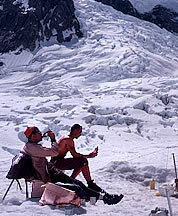 Mount Shuksan’s Sulphide Glacier was another tour that became popular during the 1960s after the Fireys started doing it. They scouted more remote locations like Mounts Hagen and Blum, approached from the Baker River by Joe and Joan with John and Irene Meulemans in 1966. This trip clarified which destinations were not worth revisiting for them. “Because of the bushwacking, we didn’t go in there again,” recalled Joe. “When you’ve got your skis on your pack, it doesn’t feel very good anymore.” The North Cascades Highway opened in September 1972. Starting the next spring, and for several years thereafter, the Fireys and friends explored ski touring opportunities along this corridor. They skied Silver Star Mountain and scouted tours around Washington Pass, Rainy Pass and Ragged Ridge, areas they knew intimately from earlier climbing trips. The Fireys were alpine tourers of the old school. In the 1950s and 60s they skied with leather ski boots, cable bindings, and removable toe irons that held the boot stable when the rear cable guides were unhooked for touring. In the early 1970s they used Gertsch plate bindings which, while heavy and expensive, offered better durability and release function than other touring bindings of the day. In the 1980s, Joe’s friend Chuck Loughney developed the “Snow Star” binding, which consisted of a Besser downhill binding modified by the addition of a hinged touring plate and piston-mounted return spring. With a seven-inch piston and spring assembly sticking out in front, the Snow Star looked like a battleship cannon, making it easy to identify the Firey crew when they were out on a tour. 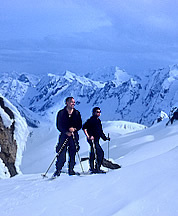 Joe and Joan’s knowledge of ski mountaineering gear and techniques were tapped several times for articles in Ray Smutek’s magazine, Off Belay. Joan embraced the growth of telemark skiing in the late 1970s and tried (without success) to get The Mountaineers to publish Steve Barnett’s landmark book, Cross-Country Downhill. Just as they enjoyed summer climbing trips in Canada, the Fireys made winter and spring pilgrimages north for backcountry skiing (see addendum). In the 1950s and early 1960s their trips were in the Selkirks and Canadian Rockies, but once they discovered the B.C. Coast Mountains, virtually all their annual trips were made there. Most of these trips were done in late March or early April, during spring break from the University of Washington. 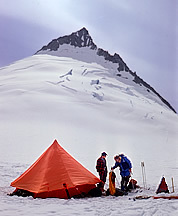 Unlike the backcountry ski scene in Canada today, which is based on a network of comfy lodges and huts, most of the Fireys’ trips were made by tent camping. The evening “happy hour” in the group tent was a venerable Firey tradition. During the 1961 trip to the Southern Pickets, Ed Cooper, who Carla recalled was “truly like a climbing bum” in those days, didn’t want anything to do with Joan’s food planning so he just carried oatmeal. “Yeah, I think that was all he brought,” remembered Joe. “But actually, we didn’t always finish all our dinners,” Joe added. Carla’s husband Jim said that was typical. “I would always say, ‘Oh, Carla, let’s just not bring anything on a trip with Joe and his friends,’” laughed Jim. The White Wilderness idea never took hold in the Cascades, and in today’s world of instant Internet trip reports, the concept seems more distant than ever. But Joe Firey foresaw in the 1970s that the feeling of discovery he had found in the Picket Range would be harder to come by in the future. In 1963, the Fireys made their first trip to the Monarch Ice Cap in the B.C. Coast Mountains. 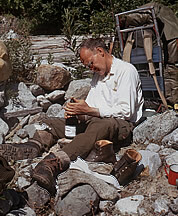 They were introduced to the range by George Whitmore, who had participated in Sierra Club expeditions to Mount Waddington and Mount Monarch in the 1950s. Joe, Joan and friends returned to the Coast Mountains regularly for more than thirty years. They climbed many of the outstanding summits of the range, including Waddington, Combatant, Tiedemann, Asperity, Monarch, Queen Bess, Cerberus, and more. The Fireys were attracted to seldom visited parts of the Coast Mountains, and over the years Joe established between 40 and 50 first ascents and new routes. Frequent companions included Frank deSaussure, Wes Grande, Dave Knudson, Mike Martin, Peter Renz, Gary Rose, and Mickey Schurr. Many others accompanied the Fireys over the years. Peter Renz coined the name “Firey Adventure Tours” for these annual trips (see addendum). Joe and Joan’s earliest ski trips in the B.C. Coast Mountains were around Garibaldi Park. Joe wrote a fine introduction to this area for the 1973 Mountaineer. But during the 1970s, they increasingly found that helicopter skiers were looking for the same sort of skiing that backcountry skiers wanted. The last time they skied in the Wedge Pass area they had to search for slopes where the heli-skiers hadn’t been. They decided to move on after that toward the Lillooet Icecap, Ryan River, South Creek and other areas farther north. But again, the heli-skiers spread out and now they are in those areas too. So Joe and friends moved farther north to Bluff Lake near the Waddington Range. Today heli-skiers are going there as well. “That’s kind of put a damper on it,” said Joe. “I’ve got nothing against the heli-skiers, except you don’t really want to go ski touring in the same place where they are working.” The expansion of heli-skiing in the B.C. 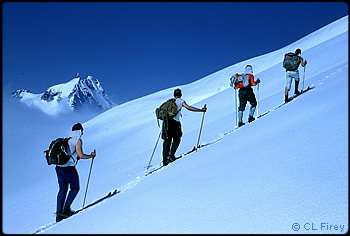 Coast Mountains can be traced directly through the backcountry skiing experiences of the Fireys and their friends (see addendum).